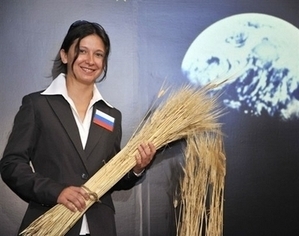 It's Elena Shaginardanova, a Russian student at Japan's Okayama University, photographed in Tokyo last Tuesday holding a bunch of barley grown from "... a third generation of barley grains that spent five months on the International Space Station in 2006." In yesterday's PopSci.com story, Jaya Jiwatram wrote, "The company only has enough barley to make 100 bottles of beer this fall and they will not be sold commercially." Taking beer-making to a whole new sphere, Japan's famous Sapporo Holdings Ltd. plans to launch a beer in November that's literally from out of this world. The brewery will collaborate with scientists at the Okayama University in Japan to concoct this unearthly beverage from a third generation of barley grains that spent five months on the International Space Station in 2006. Does the barley taste any different? Apparently, no. In fact, scientists have not found a difference in the genetic make-up of the earth-grown and space-grown barley yet, according to Manabu Sugimoto, an Okayama University biologist who has been part of a Russian project to investigate growth methods for edible plants in space. Bar crawlers will have to wait to get their hands on this enticing beverage, though. The company only has enough barley to make 100 bottles of beer this fall and they will not be sold commercially. It may be a while before the Sapporo brew hits taps, but when that day comes, one can only hope there are space nuts to go with it. More here in Mari Yamaguchi's MSNBC story on the exotic brew-to-be. Awesome I love space beer. The only thing I like more is Space Bear! Seriously, Sapporo should get that furry little dude to endorse. Thirst is nothing, image is everything and all that.